Boy strangled after rope winds around his neck in Beit Shemesh elevator. MDA teams perform child CPR operations. A 10-year-old boy is in critical condition after being strangled by a rope in Beit Shemesh on Monday afternoon. Preliminary investigation revealed that the rope was caught around the child's neck in an elevator in the building, preventing him from breathing. Teams of Magen David Adom first responders who were called to the scene performed CPR. The police reported that "a 10-year-old boy is being treated by MDA after a rope with which he apparently was playing got caught around his neck in an elevator in a residential building. Police, MDA, and firefighters are at the scene." Emergency motorcycle medic on-call Yirmiyahu Kalpholtz related: "When we arrived, we saw an unconscious 10-year-old boy in an elevator, without a pulse and not breathing," he said. "We took him out to the stairwell where we gave him life-saving medical treatment and performed extensive CPR operations. When his pulse returned, we began evacuating him to hospital while continuing the required medical treatment. His condition was defined as critical." 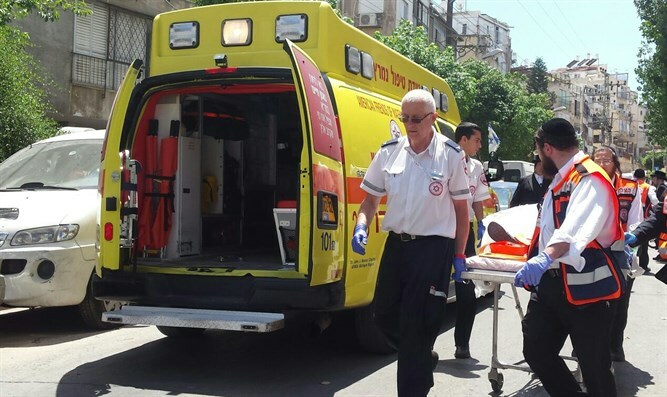 Hadassah-Ein Karem hospital reported that the boy is still in life-threatening condition. The child's name, which was released so that people could pray for his well-being, is Yechiel ben Golda.